Join the Chambers of Commerce of Dublin, Hilliard, Powell, Union County and Westerville, and their members, for one of the largest multi-chamber events in the area. This is your opportunity to network with hundreds of area business professionals while enjoying complimentary appetizers and beverages. Nearly 100 exhibitors and 500 business professionals are expected to be in attendance. A limited number of exhibit spaces are available and will fill on a first-come, first-served basis. Go online or call the Dublin Chamber at 614-889-2001 for details. No refunds. By attending a Chamber event you are granting permission to the Dublin Chamber of Commerce, the Dublin Chamber Civic Foundation and anyone authorized by the Chamber to have unlimited right, without charge, to use your likeness in photos, videos, recordings and in all media now known or hereafter created to be used and distributed in perpetuity for promotional and publicity purposes. By attending an event you agree to release the Dublin Chamber of Commerce and Dublin Chamber Civic Foundation, their staff, board of directors, members and their partners from any liability. February 21 from 4:30 to 7 p.m. 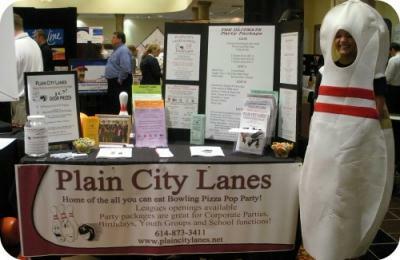 Call the Dublin Chamber at 614-889-2001 for details about exhibiting.